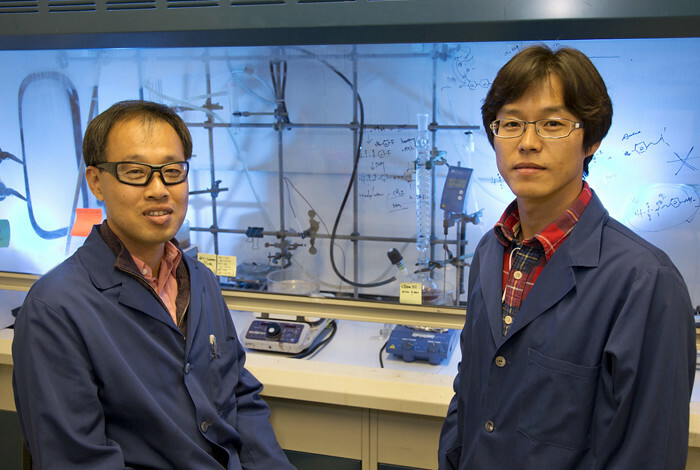 “Polymer-based fuel cells are regarded as the key technology of the future for both vehicle and stationary energy systems,” said Yu Seung Kim. LOS ALAMOS, N.M., Aug. 23, 2016—A new class of fuel cells based on a newly discovered polymer-based material could bridge the gap between the operating temperature ranges of two existing types of polymer fuel cells, a breakthrough with the potential to accelerate the commercialization of low-cost fuel cells for automotive and stationary applications. Researchers on this project include Kwan-Soo Lee (Los Alamos National Laboratory, Chemistry Division), Jacob Spendelow, Yu Seung Kim (Los Alamos National Laboratory, Materials Physics and Applications Division), Yoong-Kee Choe (National Institute of Advanced Industrial Science & Technology, Japan), and Cy Fujimoto (Sandia National Laboratories). Reference: “An operationally flexible fuel cell based on quaternary ammonium-biphosphate ion pairs” Nature Energy | DOI:10.1038/NENERGY.2016.120. Los Alamos authors: Kwan-Soo Lee, Jacob Spendelow, Yu Seung Kim, with collaborators from Sandia National Laboratory and National Institute of Advanced Industrial Science & Technology, Japan.